Business management is a broad field that trains people for managerial roles in technology, retail, education, government and other sectors. Business management degrees enable you to acquire a mix of technical and soft skills. Technical skills in business management include learning the principles of accounting and finance, business law, operations management and information systems. Soft skills are equally important in business management and could include learning about leadership, negotiations, teamwork and employee motivation. Unless you don’t know who you are and how you are performing, you cannot become better! Carry out market research, know your competitors, excel industry standards, and get ahead of the curve! With feedback, you generate a pool of new ideas, keep your customers happy, retain your employees, and stay current with the trends of industry. Pay employees for referring qualified people to your business. Save recruitment costs and retain employees longer! By vanpooling and transport subsidy, attract a larger pool of employees and cut down on absenteeism and turnover. Stagnation is disaster. Employees need training. Business needs better systems, newer technology, and a culture where everybody learns and contributes. Build reputation, gain customers, make the job of your employees meaningful, contribute to the society, and be more competitive. Let employees apply for the jobs posted internally, allow them to become the best fit for a position, and prevent turnover. Reduce excess layers, enhance communication, let employees make decisions, and be more efficient. Don’t let bookkeeping become a mystery. Record day to day transactions clearly and make them easy to understand. Business management remains among the most popular fields pursued at institutes around the United States. By some estimates, one in five students in colleges pursues business management. This is because students find the material interesting and practical. Business management degrees normally take four years to complete. Initially, students need to complete general education courses such as math, English, sociology, and psychology. After completing general education courses, students need to pass core courses such as accounting, ethics, business law, and economics. Then they need to select a concentration and complete courses according to their chosen area of study. They may also require a project, a thesis, or an internship to complete the degree. Business management is often pursued at the undergraduate level. This degree is generally called a BBA or Bachelor’s in Business Administration. Many who complete a BBA go on to complete an MBA or Master’s in Business Administration. But you are not required to have a BBA to pursue an MBA. The MBA is general enough that those with no background in the field are able to enter and complete the program. In fact many MBA programs are eager to recruit people with diverse backgrounds in engineering, the sciences, liberal arts, humanities and social sciences. Business management degrees allow you to build commercial awareness and help you contribute to your organization’s growth. An important consideration in admissions in an MBA program is work experience. It is common for students enrolled in MBA programs to have between 2 and 4 years of work experience, though some schools are willing to overlook work experience in the admissions process in certain cases. MBA programs stress work experience that focuses on leadership and management. MBA programs involve case studies and discussions and are thus ideal for those who have worked for a few years and have personal experience in managerial challenges and their potential solutions. While BBA and MBA are the most common titles for degrees in business management, some institutes may offer similar or modified courses with titles like Business Management or Economics and Management or Management Studies. Some institutions prefer to offer a BBA or MBA in general management. Such degrees by nature try to give you a broad overview of the field without forcing you to specialize in a certain field. This is particularly common at the most prestigious business schools. Other institutions see value in encouraging students to specialize particularly at the MBA level. Specializations in marketing, finance, human resource management, technology and operations are among the most popular choices. In a typical case, the first lot of courses in an MBA program will comprise of core courses that all students in the program complete. The second stage is when students have the option of enrolling in electives in business management to complete a specialization. Starting salaries in business management tend to be above average for college graduates. But they tend to be a little lower than those of engineering and technical fields. Salaries after obtaining business management degrees go up with work experience and additional training. According to the US Bureau of Labor Statistics, management analysts have a median annual wage of $78,600 as of May 2012, with those in the top ten percent lot earning above $142,580 annually. Are there any corporate financial aid and loans provided for the Business Management students? What is business management and what skills do you need for this? How are business management classes online conducted? Are all business management courses online accredited? Q:Are there any corporate financial aid and loans provided for the Business Management students? A:The Business Management Students can get financial aid from corporations or business tycoons. These include Coca Cola and Walmart. Through these loans, students can accomplish their educational goals without worrying about expenses like college traveling and accommodation. Q:Online Property Management Schools offer which degree programs? A:Online Property Management Schools offer various degree programs. These include the Bachelor of Sciences in Business Administration - Property Management, Associate's degree in Property Management, Certificate in Property Management, Associate in Real Estate Management, Associate in Real Estate Appraisal and many other areas of specialization. Q:Are there any Property Management Online schools? A:Yes. There are a few schools offering the Property Management degree online. These include institutes like Technical Career Institute, Ashworth College, Allied Real Estate Schools and Colorado Technical University. Q:What are the advantages of pursuing a business management degree online? A:There are a number of benefits associated with pursuing a business management degree online. These degree programs are particularly useful for students who are unable to attend classes on campus. The curriculum for these programs is quite extensive and discusses every subject in detail. Moreover, students also find these degrees relatively inexpensive as there are no transportation and living costs involved. Interested students are advised to search our website for an extensive list of online colleges offering this degree. Q:Can you give some information about an accelerated degree in business management? A:An accelerated degree in business management is available at undergraduate and graduate levels. This means you can complete the program in less than the usual time span. Accelerate programs usually have a higher work load and a more intense class schedule. You m ay not even get summer of semester breaks throughout the duration. Q:What is business management and what skills do you need for this? A:In the ever-changing and demanding world we live in, where various businesses are competing against one another a business management degree becomes all the more important.To handle the challenges of a business you need not only smart administrative skills and an understanding of the various aspects of the business at hand. Business management demands good leadership and communication skills. Q:What will I do with business management education? A:Business managers can be expected to perform a broad range of activities within the sphere of a company's operation. The exact duty of a manger will depend on the job title, field, company and the industry. Business managers are generally responsible for planning, directing and overseeing operations of a firm. Q:What is Business Management Degree useful for? A:With a business management degree, you can pursue a diverse range of business careers. Almost every organization requires the need of business graduates for its functioning. If you have acquired a business degree, you can apply for numerous managerial level jobs and executive level jobs. These jobs are found in all sectors of the economy, ranging from the tertiary sector to manufacturing sector. Q:What is a business management degree? A:Although different schools have their own curriculums and styles of education, a typical business management degree requires four years at the bachelor's level. The four year bachelor's degree usually comprises of 120 semesters hours, at the end of which the students receive the degree. There are some schools that offer associate degrees with a duration of two years. Q:Why should I go for a business management degree? And what specialty areas are available? A:A management degree can be pursued at undergraduate and graduate level. The program is geared towards equipping students with fundamental knowledge about management and business functions. You will acquire important managerial skills that will help you qualify for management job positions in all kinds of organizations. You can pursue different specialization areas such as marketing, supply chain management, and human resource management. Q:Degrees in business management cover what kinds of subjects? A:A business degree will usually entail a number of managerial subjects as well practice based subjects. These programs are designed to equip students with fundamental knowledge of business administration and finance. Some of the core subjects include business management, strategic development, marketing, finance, supply chain management, and human resource management. Q:Can I find a business manager degree at bachelor level? A:Yes, you can enroll in a bachelor level management degree. However, there is degree by the name of business manager degree. The most commonly pursued degree program in this field includes the following: bachelor degree in business administration. The program is designed to equip students with managerial skills and prepare them for managerial job positions in businesses. Q:At what levels can I find a business management degree? A:Business management degree programs can be earned at bachelor level, master level, associate level, and doctorate level. This academic area is one of the most highly pursued specialization areas nowadays. Business management certificate programs are gaining popularity as well. Students with this degree can look forward to managerial careers in organizations. Q:Can you tell me about all degrees for business management? A:There are plenty of business management degrees one can pursue. Business management is one of the most important areas in every organization. Students how have a thorough understanding of management strategies and skills can work as managers and executives at top companies. Degrees in business management can be earned at bachelor, master, and doctorate level. Q:What are business management degrees designed for? A:Business management degree programs are designed to give aspiring individuals in-depth information about management strategies. Students learn how to effectively develop business management models and apply managerial principles in various organizations. Managers are required in almost all types of business organizations nowadays, making this degree very useful and high in demand. Q:How and why is an online business management degree less expensive? A:Yes, an online degree in any field such as business management is less expensive as compared to a campus based program. Students do not have to worry about extra costs related to travelling or books. All the coursework is completed online which only requires a lap top and a reliable internet connection. Q:With a degree in business management, are my career options good? A:Business management is principle that is applied in almost every kind of business organization. The demand for managers is always high. If you have a degree in this field, you can apply for managerial job positions. It is important to remember that the job type will depend upon your areas of expertise and specialization. Q:Can you tell me about duration of online business management degrees at undergraduate level? A:At the undergraduate level, students can complete a bachelor's in business administration (BBA) , usually in four years. Online programs are convenient in that students can study at their own will and at their own ease, whenever and wherever they wish to do so. They can even finish the program early or late, depending on their own choice. Q:Is a management online degree worth my time and money? A:Management degree programs are available at all levels of post-secondary education. If you are interested in the field of business management and wish to pursue a managerial career ahead, getting higher education in this field is necessary. With a bachelor or masters degree in hand, you can apply for well-paying managerial job positions. Q:How will I be able to get hands on experience or any kind of practical experience in business management online classes? A:Many students ask similar questions on hands on experience is acquired through online classes. It is important to remember that business management courses comprises mainly of theoretical subjects. You can easily study these subjects online via classroom conferences and video lectures. For subjects that are more practical in nature such as project management and research studies, you can take a few classes at the campus. Q:In bachelor business management degrees online, what kinds of introductory subjects will I cover? A:Bachelor degree in management is an undergraduate program that aims at equipping students with a thorough understanding managerial principles. The coursework entails many subjects that are basic and advanced in nature. During the initial phase of the program, you will cover introductory subjects such as strategic management, finance and accounting, marketing, principles of management, and business ethics. Q:Online business management degree programs are offered by which kinds of institutes? A:Business management is one of the most popularly pursued academic areas nowadays. There are a number of business schools that offer business management degrees to students. The program offering will vary from school to school, so you will need to get in touch with the school to find out exactly what degree programs they are offering. Q:I am planning to enroll in online management degrees after high school. Do you think online education will be a good idea? A:Online education is slowly gaining popularity and is becoming the new trend in learning. There are many benefits in online education programs. You can study at any time of the day according to your free time and convenience. Apart from this, you can cut down on extra costs related to travelling and text books. Q:Are there any courses related to project management that I will have to study in an online degree business management? A:Project management is a course that is being studied many management degrees. PM has become an integral part of the business management curriculum. Students can also take this course as a specialization area. You can check the curriculum of the program and institute you are planning to enroll in to confirm the availability of PM. Q:How are online business management classes conducted if I study from my home? A:Online classes for business management are conducted via conferencing and video lectures. You can acquire recorded lectures easily, or even participate in live online classroom conferences. This adds to convenience and also helps working students manage their jobs side by side. The coursework is completed online and does not require you to take any class at a campus based institute. Q:By taking online classes for business management, will I have to quit my part time job? A:No, you do not have to quit your job whether it is full time or part time. This is one of the main benefits of online classes. You can study with ease and convenience, without worrying about missing classes or work. On the other hand, you will also find online classes more affordable as there will be no extra costs of travelling or textbooks. Q:Management degrees online can be pursued at bachelor level or not? A:Management degree programs are available at bachelor level as well as masters level. You can pursue this academic principle at all levels of higher education. There are a number of business colleges that offer associate, masters, and bachelor degrees in management. Before you enroll in any school, be sure to check the accreditation status of the institute and the course curriculum. Q:With an online degree in business management at associate level, what kind of a career can I look forward to? A:You can apply for an entry level job position with an associate degree. This is one of the most basic undergraduate degrees available in the field. You can work as an assistant manager or a supervisor with an associate level qualification. If you want to pursue a more high paying career with better potential for growth, you should earn at least a bachelor or masters degree. Q:How are business management classes online conducted? A:Online business management classes are conducted through online conferences, one on one sessions, presentations and slideshows, and classroom conferencing. You will be required to cover the coursework online. All you need is a lap to and a reliable internet connection. Online education is slowly gaining popularity and is becoming the new learning trend. Q:Are all business management courses online accredited? A:Accreditation is one of the most important factors to consider before enrolling in any institute. Accreditation basically reflects the institute's compliance with educational standards. You can expect quality education services and recognition from accredited institutes only. To find out whether a school is accredited or not, you can conduct a research online or simply get in touch which the school to find out. Q:I am thinking of enrolling in business management online courses since my job doesn't allow me to join an institute fulltime. Do you think this is a good idea? A:Online education is a great way to enhance your credentials if you are unable to attend a campus fulltime. By enrolling in an online school, you can continue your job and still be able to study without having to compromise on either. Online education allows students to study at any time of the day and at a desired pace. Q:A business management online degree is designed to help students learn what? A:Business management degree programs are designed to help students acquire in-depth information about the overall management functions of businesses. The program covers every aspect of the field including finance, marketing, and strategic management. The field is among the most popularly pursued academic fields today. You can earn a business management degree at undergraduate and graduate level. Q:In an online management degree, what will the marketing course teach me? A:Marketing is an important component of business management. The area aims at equipping students with marketing skills. Marketing is all about promoting a product or a service through advertisement and placement. You can also choose marketing as a specialization area if you wish to pursue a career in the marketing field. Q:Online business management courses have gained a lot of popularity due to what reasons? A:Online courses in business management are being pursued by many individuals all over. Students can fulfill their academic goals without attending a campus based institute. This mode of learning is more convenient, flexible, and affordable. Students can cut down on costs and also manage a full time job side by side without having to compromise on either. Q:In a management degree online, is all the emphasis laid on theoretical work? Or will I also get a chance to build a few skills? A:Online degree programs in management mainly comprise of theoretical subjects. You will study online via video conferences and online notes. This will help you develop a sound understanding of concepts and theories. On the other hand, managerial skills are also a major part of the program. For this purpose, you may have to take a few classes at the campus, or take part in field projects. Q:How will I get enrolled in a graduate level business management degree online? A:The admission requirements of graduate programs depend upon the institute and may vary from college to college. The most common admission requirement for masters level degrees is completing a bachelor degree first. Other requirements may include CGPA scores and letters of recommendation. Find out more about the admission requirements by first choosing an institute. Q:What is the advantage of degrees in business management? A:Students can avail a number of advantages from degrees in business management. They prepare people for managerial roles in technology, education, government, and retail. Students can acquire both soft and technical skills with business management degrees. They learn a number of crucial skills such as employee motivation, teamwork, negotiations, and leadership. Q:Can you please tell me what is business management? A:Business management is a broad field that trains people for managerial roles in a number of different sectors including in technology, retail, education, government, etc. It entails learning a variety of skills, some of which are the principles of accounting and finance, business law, operations management, information systems, leadership, negotiations, teamwork and employee motivation. All these components train candidates in the fundamentals of business management. Q:What does a business manager do? 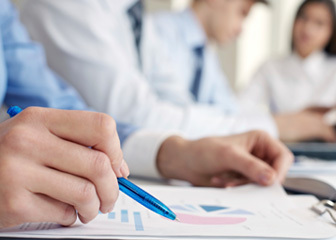 A:Business managers perform a range of duties such as the following: help companies reach goals and objectives, coordinate different business functions and activities, evaluate and research data, perform administrative tasks, ensure resources are available, train employees, evaluate results, implement budgets, and more. Business managers are crucial to an organizations success. Q:What is business process management? A:Business process management can be defined as a systematic approach used to improve performance and processes in an organization. By using different techniques, the process for production is optimized, lowering errors and increasing production quality. Many organizations are using business process management. It is similar to the six sigma approach. Q:What is the difference between business administration and business management? A:Business administration and business management overlap each other and belong to the same field. Business administration will focus upon a wide range of topics such as marketing, finance, resource management, etc. On the other hand, business management will highlight areas of management and leadership. Both academic disciplines are offered at associate, bachelor, and masters level. Q:How much does a business manager make? A:The income level of a business manager will vary from place to place, and will depend upon the specialization, education, and skill set of the individuals. According to the US Bureau of Labor Statistics, service managers made a median annual income of $81,080 in 2012, marketing managers made $115,750, financial managers made $109,740, and human resource managers made $99,720. Q:What does a business development manager do? A:A business development manager is a professional who works with companies and organizations to develop, expand, and generate new business opportunities. Typically, a business development manager will carry out tasks such as product development, marketing, and distribution. In addition, they are often responsible for writing contract proposals, presentations, and meeting with new clients. The main objective of all that they do is to maximize a company's business potential and help them develop new strategies and products to do so. Q:Can you tell me what to do with a business management degree? A:A degree in business management opens up a wide variety of business opportunities. The degree trains candidates to be able to take on managerial roles in sectors as diverse as technology, government, education, retail, etc. Depending on your career goals and aspirations, you can pursue different specialization areas such as marketing, supply chain management, and human resource management. Q:Can you tell me how to become a business manager? Q:What is business management degree and how do I earn it? A:A management degree is an educational program designed to prepare students for careers as managers. Students can pursue business management at associate, bachelor, and masters level. The curriculum will entail a number of subjects and assignments. To successfully earn the degree, students must cover all the components and acquire a minimum number of credit hours. Q:What is business information management? A:Business information management is a degree concentration which is intended for those students who want to learn how to build their own businesses through entrepreneurship and the use of business skills, which involves applying technology and computational methods in order to make business organizations more efficient and effective. This field requires a solid understanding of business practices combined with the role information systems play within an organization. Q:What is business management and administration? A:Business management and administration is a particular concentration which enables candidates to prepare for jobs in business management positions. These include many management level jobs, the main duties of which entail managing people, the business operations, and financial record keeping. These jobs aim to achieve greater efficiency and yield more productive operations for businesses. Q:What is business contact manager? A:A business contact manager is someone who supervises office workers and provides customer support. They are also commonly known as customer service managers, office managers, team leaders and administrative supervisors. The job duties for a business contact manager will vary depending upon the business and its size. Commonly, they coordinate and execute business-related goals. They also are responsible for hiring and training new employees within the department, and providing ongoing training for existing employees. Q:What is business continuity management? A:Business continuity management is a management process or framework which is designed to identify a particular organization's risk of exposure to internal and external threats. It involved identifying the key products and services of a business and devising plans to ensure that in the event of any form of disruption, the organization has stability and security. A framework of effective responses needs to be identified to ensure that the interests of the company are safeguarded. The ultimate goal of business continuity management is to ensure resilience for organizations. Q:What is business development manager? A:A business development manager is someone who works with particular companies and organizations to help them develop, expand, and generate new business opportunities. This is done in order to improve an organization's market position, increase its clientele, and achieve financial growth. Business development managers often hold senior positions in a company and carry out tasks which include: defining long-term organizational and strategic goals, building customer relationships, identifying business opportunities, negotiating and closing business deals, and maintaining extensive knowledge of current market conditions. Q:What is international business management? A:International business management refers to the study of global market places and management practices. Students pursing this as an academic field will gain insight on the global outlook and modules. From international accounting practices to policy making and from supply chain to government regulations, a wide range of areas are covered in this field. Q:What do business management majors do? A:Business management majors can prepare for careers in diverse corporate environments and industries such as retail, manufacturing, and services. The field will incorporate various management strategies and skills that will enable students to qualify for managerial roles in organizations. Students can work as finance managers, administrative personnel, marketing managers, supply chain managers, and more. Q:What is business management as a major? A:Business management can be defined as an academic field or major that highlights management strategies and policies. Students will learn how businesses re run and managed through effective coordination and attainment of organizational goals. This field is intended for students who wish to work at managerial and administrative posts in firms. Q:What is management in business? A:Business management is a course offered for study in many business programs. Students can also pursue this field as a major. Business management refers to the various principles of management used for effectively running organizations. Students in this course will learn how to apply managerial principles and manage resources to achieve organizational goals. A:Business management is a popularly pursed academic major. Students will learn about various management strategies and disciplines used in modern-day organizations. Since effective management is needed in almost all organizations, the demand for management majors remains steady. Students can seek a variety of managerial job positions and administrative posts in firms.